Coolsculpting vs Clatuu. Which is one is best? It can often be difficult and confusing when trying to decide which fat-removal procedure is best. Each option has its own list of pros and cons, and what’s best for one person may not be best for everyone. So in this article, we’ll look at the differences between Clatuu 360 and Coolsculpting. CoolSculpting, or cryolipolysis, is a non-invasive, fat-reduction technology that was created by ZELTIQ Aesthetics, Inc. Unwanted fat cells are removed from underneath the skin without surgery. According to research by two Harvard dermatologists, selectively freezing fat, or adipose, cells reduced bulges of fat by 20-25 percent. 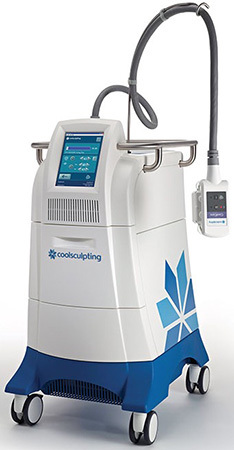 People undergoing CoolSculpting treatments typically require one to three treatments to reach their desired result. Marks are made on the area that will be treated to ensure the precise placement of the device. A transparent gel pad is used on the area to protect the skin. The applicator head is then put into position and the vacuum is turned on. Once the bulge of fat is sucked in the cup, two cooling panels numb the area. The fat cells freeze due to the controlled cooling without causing harm to the nerves, muscle, or skin. A CoolSculpting treatment typically last around an hour. A few treatments spread out over several weeks is generally needed to get desired results. During the weeks following the treatment, the body naturally eliminates the dead, frozen fat cells through the liver. Clatuu 360 is a fat freezing treatment that utilizes controlled cooling technology to get rid of stubborn, unwanted fat. The treatment results in a permanent reduction in fat cells underneath the skin by freezing them, similar to CoolSculpting, without damaging any of the surrounding tissue or cells. Also like CoolSculpting, Clatuu is a non-invasive, non-surgical treatment that treats fat bulges in a targeted area of the body that people haven’t been able to get rid of through a healthy diet and exercise, such as the sides, stomach, and back. The cooling technology of the fat-freezing treatment has been around for a while now, but thanks to developments in the technology, more precise results can now be achieved, and treatments are becoming more affordable. Clatuu 360 offers even better results due to its use of the latest in fat-freezing technology, as compared to more traditional, older fat-freezing treatments. The technologically advanced, 360-degree precise cooling handpieces provide a more even cooling process across the area of the body that’s treated. How Does Clatuu 360 Work? Clatuu 360 works by drawing bulges of fat gently into its applicators and then cooling them to negative nine degrees Celsius. This cold temperature freezes and permanently destroys the extra fat cells within the targeted area, without causing any damage to normal cells. The dead fat cells are safely eliminated from the body through the natural process of waste removal, resulting in a gradual reduction in the treated area’s layer of fat. The treatment provided by Clatuu 360 offers long-lasting, visible, and measurable results in body sculpting without having to undergo surgery. During the treatment, around twenty-five to thirty percent of fat cells are typically eliminated from the targeted area. * CoolSculpting prices are averages quoted by various Brisbane clinics. * Promotion not available with any other offer or discounts. Schedule a free consultation today to see if fat freezing is right for you. While CoolSculpting offers great results in body contouring, the Clatuu 360 uses the newest and most advanced cooling technology that’s available today. This means that Clatuu is often favored over CoolSculpting in terms of results and efficiency. The Clatuu 360 features dual handpieces, allowing two areas of the body to be treated at the same time, saving patients time and possibly money. The handpieces of the Clatuu are the first patented 360-degree applicator heads, providing faster and more effective fat reduction. Due to being able to treat two areas at once and being more cost effective, the Clatuu 360 is often preferred over CoolSculpting. Both Clatuu and CoolSculpting offers desired results, so in many cases, which is better will largly depend on the treatment area, budget and availability in your area.